9:52pm – I’m going to close down this brief liveblog, but I will be back in the morning with further analysis, including a focus on the Legislative Council. 9:51pm – Let’s revisit the Greens races. Lidia Thorpe in Northcote has fallen further behind, trailing by 1100 votes. The ABC is projecting that the Greens’ Tim Read is leading in Brunswick, but either way it looks very close. The Greens have widened their gap on the Liberals in Prahran. It is worth noting, though, that the 2PP count is between Liberal and Green, not Labor and Green. Presumably Liberal preferences will favour Labor, which could see Labor win there. 9:47pm – There are currently four rural seats where independents are in play, in addition to Shepparton where Susanna Sheed has been re-elected. In Benambra, Jacqui Hawkins is on 30.5% of the primary vote, behind sitting Liberal MP Bill Tilley but well ahead of Labor, who are on 18%. Tilley is on less than 38%. We have no Liberal vs Independent 2CP count, but if Hawkins gains every Labor and Greens preference she will make a majority – and that’s ignoring another 9.5% of the vote with other candidates. It’s worth noting that Benambra overlaps with the federal seat of Indi, held by independent MP Cathy McGowan. Labor’s Mark Richards has a big primary vote lead in Morwell. He’s on 36.7%, followed by sitting independent Russell Northe on 18%, and a further 22% between the Liberal and National candidates. We don’t have a Labor vs Independent preference count, but it seems clear that the Nationals won’t regain t his seat. Independent Ali Cupper is on 32% in Mildura, which puts her in second place. The ABC is currently estimating a narrow win for her, but it’s not clear if this is based on real preference data. Independent candidate Tammy Atkins is on 20% in the Nationals seat of Ovens Valley. This is just behind Labor’s Kate Doyle on 20.4%, with sitting MP Tim McCurdy leading on 44.3%. Atkins would need to overtake Labor either on primary votes or thanks to minor candidate preferences. It’s hard to see her winning but she has a chance. 9:38pm – Following on my previous point, this map shows (in the underlying colours) the results of the 2002 state election, when Labor won 62 seats. You can see that they held on to a core of inner south-east Melbourne. The green overlay shows seats which Labor is currently on track to gain off the Liberals. 9:05pm – Let’s discuss what is happening in the Liberal heartland of Melbourne. The last Labor landslide was in 2002, when a precarious first-term Labor government was re-elected with 62 seats. But a lot of the seats that have changed hands tonight were not ones gained by Labor. In particular it’s worth noting Labor gains in Bass, Box Hill, Caulfield, Nepean and Sandringham, along with possible gains in Hawthorn and Brighton – all seven of these seats stayed in Liberal hands in 2002. Apart from Bass and Nepean, these seats are in the inner-city strip of Liberal heartland. On the other hand, Labor did not pick up Evelyn, Ferntree Gully, Forest Hill, Gembrook and Hastings – all more suburban seats Labor gained in 2002. I’ll leave it to tomorrow to analyse why this is the case, but this trend does remind me of the backlash we saw in Wentworth. 8:49pm – There are five seats where the Greens had hopes. They appear to have retained Melbourne with basically no swing, and are narrowly behind in Northcote, which they won in last year’s by-election, trailing by 800 votes. They are also less than 500 votes behind Labor in Brunswick. Despite expectations that the Liberal Party sitting out Richmond would help the Greens win, Labor has increased their two-party-preferred margin from 1.9% to 7.6%. And then there’s Prahran. On a two-candidate-preferred basis, the Greens’ Sam Hibbins has gained a a swing of almost 12% against the Liberal Party. But it’s not clear if he’ll make the final two. At the moment Labor is leading with 31.3% of the primary vote, followed by Sam Hibbins on 30.6%, and the Liberal Party on 30.1%. If Hibbins falls into third, Prahran will be another gain for Labor. We will be unlikely to know this seat for a week. 8:42pm – I’m sure you’ve all seen by now, but Labor has comfortably won an increased majority in the Victorian state election. At this time the ABC predicts that Labor has gained Bass, Bayswater, Box Hill, Burwood, Caulfield, Mount Waverley, Nepean, Ringwood, Ripon, Sandringham and South Barwon. This gives Labor at least 56 seats, up from 45 before the election. The ALP’s Health Minister Jill Hennessy just said on ABC TV that it is important to get on with their platform as soon as you are elected to government which Andrews did. The former Liberal government did not. 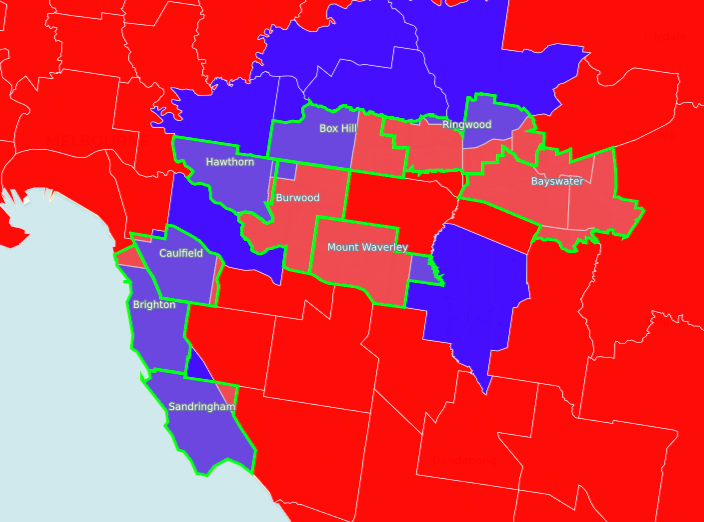 Kennett got on with their platform early too and transformed Victoria from a rust belt state to a dominate state in 7 years but the voter still defeated his government (only just) and I cant understand why. ABC TV reported at about 8.30 pm that Jeff Kennett said Michael Kroger should resign as Liberal State President. Daniel – I agree Kennett is the go for Liberal State President although he is nearly 70 now but still with it. The Greens have a new song to play at their next series of pub meetings – the 1960’s surfing tune “wipeout”, perhaps as a duet with the Liberals. Good to see Victorians have taken Spray can full of DDT to Greens. Hopefully after federal election we will see the end of crypto communists and crypto fascists. Andrew – Yes and starting in Qld with the NLP who are really hillbilly bible belt Nationals (unique to Qld) who absorbed and destroyed the smaller Liberal party in the amalgamation a decade ago. Looks like the pre-poll votes coming in are swinging back seats that were early on claimed as wins for the ALP. Something really went wrong for the Libs in the final week. Adrian – regarding Bracks’ stunning victory in ’99, from what I’ve read, it seems to be due to the regions (Geelong, Ballarat, Bendigo) feeling like they had been abandoned by Kennett’s government, with the ALP really pushing forward that message (and having its main campaign office in Ballarat then) – perhaps in the past they were swinging areas, but ever since then, they’ve been much more rock solid for Labor. WL – yes probably correct on both matters. The Lib campaign in the final week was knee jerk stuff pandering to the irrelevant Christian lobby on injecting rooms or raving on about Richmond but with no Liberal candidate. The opinion poll companies got it badly wrong again. They should stick to asking question about favourite laundry powder or which beer is best. They should abandon trying to guest the voters mood in relation to elections. Surrounded by red. The new map looks like the final days in Berlin in 1945. Adrian Yes Berlin is a good analogy. But 4 years later Berlin was on the mend. I think I was conceived in Berlin in 1949. My elder still born brother is buried in British Military Cemetry in Berlin and from the ruins of that city rule of law and economic growth came. From that city those convicted at Nuremberg we’re taken for their next stage on their journey to eternal damnation via the hangman at Spandau. The Legislative Council result reflects that a third of us think both ALP and Liberals are unfit to clean out the toilets in Spandau prison. Berlin rose from the ashes so can Victoria but not if Liberals are going to follow the road to moral degeneracy laid by Labor. Declare their principles and stick to them. Best News all night was Victory in Eastern Victoria for Vern Hughes in Legislative Council. Vern is an example of an individual sticking to fundamental principles even as he has moved from party to party. Look up Civil Society and Mutual Party and then ask yourself why Australian Country Party , Katter, DLP and Xenophon are not in same tent. WL, I don’t know if it’s “something went wrong for the Liberals”, as just the fact that conservative voters seem more likely to vote pre-poll. We already see a fairly strong pro-Liberal trend in postals, maybe pre-polling is just going the same way? “Bible Belt Nationals” did not absorb “smaller liberal party in Queensland”. The likes of George Christiansen allowed their party of principle to be taken over by neo-liberal ideology. One lesson is quite clear from Victoria is build the bush so that infectious moral degeneracy does not become an influenza epidemic that kills of industry, productivity and morality. Not sure how you could say the pollsters got it wrong Adrian, it looks pretty accurate. They predicted a swing to Labor, that’s what we got! I don’t know where the final 2PP will land, but it looks like the published polls underestimated Labor. Either the swing is bigger than what the polls were showing, or it’s been concentrated in electorally sensitive areas. Though nonetheless, the polls were showing a swing to Labor. In retrospect, there should have been more talk about where Labor was going to pick up seats, and less about the unlikely prospect of Liberal gains. Take the sand belt. On election eve, the Liberals were talking up their prospects in these seats. Yet all Labor incumbents have been returned with at least 60 per cent of the two party preferred. That’s the sort of result you’d expect when the opposition has given up and instead concentrated on fire-walling their own seats. Ben, Why did allot of the seats that they said labor would gain swung back to the coalition? Bayswater,Hawthorn,caulfield and more? How on earth did they swing back? Voter fraud? Daniel, those seats “swung back” because the prediction models underestimated the Liberal strength in the early votes. The same thing happened in Wenworth where Phelps’s apparent win was suddenly in doubt when postals and pre-polls came in late in the night. There’s a lot more early voting than there used to be and it seems that hasn’t been properly factored into the prediction models. I hope the ABC tweaks its algorithms in time for the NSW and federal elections. Two polls that I saw got the percentage result right what they missed was the Liberal wipe out. A 50.00001% major party result uni formally applied across the whole state = 100% of seats going to that major party. I have great faith in polls and regard Newspoll as being the most accurate having replaced Morgan Gallup poll when Bulletin ceased publication. Problem with all the polls is that they are at best accurate statewide and never delve beyond the most basic of questions. A poll of why voters changed their votes would be useful but the cost of doing this accurately puts it beyond papers budgets. Conspiracy theorists are always reluctant to accept the accuracy of polling because it does not fit into John Bircher ideolgy. Polling companies are seen as part of International Jewish Conspiracy stretching back to Protocols of the Elders of Zion. Possibly not a landslide anymore, but a good result. And I would argue likely to be close to the polls after the adjustment in the inner south-east. There are probably still another 4000-5000 absentee votes to be counted per seat too, and those I expect will break similarly to the ordinary polling place results so that should push the 2PP back out a little more and possible put a couple of the scares in blue ribbon Liberal seats back in play (eg. Absentee votes should deliver Hawthorn to the ALP and put them right back in the Sandringham contest too – although Brighton is out of reach and Caulfield increasingly slipping away). In Caulfield, in 2014 the absentee votes favoured Labor 57-43. If you even replicate that without a swing this year, it tightens the result considerably, but if you add a Labor swing on top of that, they could easily close the 1100* vote deficit they currently have. * The VEC has an error in their 2PP count picked up by the polling place 2CP results on Poll Bludger; they have the 2CP results the wrong way around in Elsternwick North which equates to a 600 vote correction in Labor’s favour. In regards to the above comment about the error, the mistake is confirmed because it’s a mathematical impossiblity. The VEC results have a Labor primary vote of over 42%, but entered a 2PP result of 63-37 favouring the Liberals. It’s impossible for Labor to have a higher PV than 2PP, so the 63-37 is clearly the wrong way around and should be 63-37 for Labor. The difference is 600 votes which is significant and reduces the current Caulfield margin from 2.9% to 1.8%, with most postals & pre-polls already counted and thousands of absentee votes which heavily favoured Labor last time even without a swing still to come. I would call it a ladnslide, even if the Liberals were able to save Brighton, Hawthorn, Caulfield and Sandringham because we have seen a government returned with a sizable swing by Victorian standards, and those previously safe Liberal MP’s will have to work hard to make sure they don’t lose in 2022 because the last thing the Liberals would want is to have to spend the 2022 campaign fighting to hold its own backyard. I had expected this election to be akin to the 1988 result but it has finished up being more like 1982 when the Liberals also nearly lost Sandringham and Hawthorn which was then on a less friendly boundary.